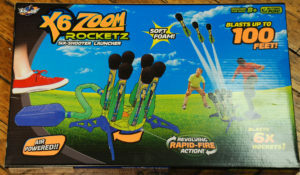 The $30 Zing X6 Zoom Rocketz Six-Shooter Launcher comes in a nicely printed box that boldly proclaims: “Blasts up to 100 Feet!” Upon opening, we discovered that some assembly was required, but it was no big deal (at least for an adult). Once the somewhat fidgety base was put together, and each foam-tipped rocket was placed onto its launch column, we were good-to-go. The base and associated air bladder are constructed of decent-quality plastic, while the rockets are of a decidedly thinner-gauge plastic to reduce weight. 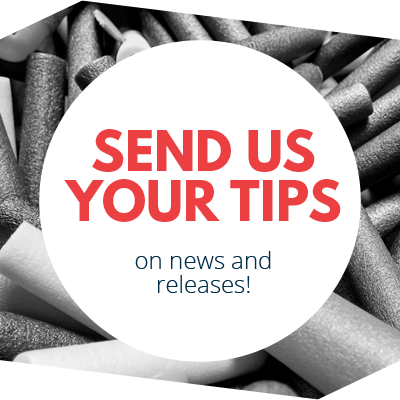 These rockets have reflective, foil-wrapped bodies and spin-inducing “Roto-Fins.” There are no small parts in the kit, and we had no functional issues during our entire test period. 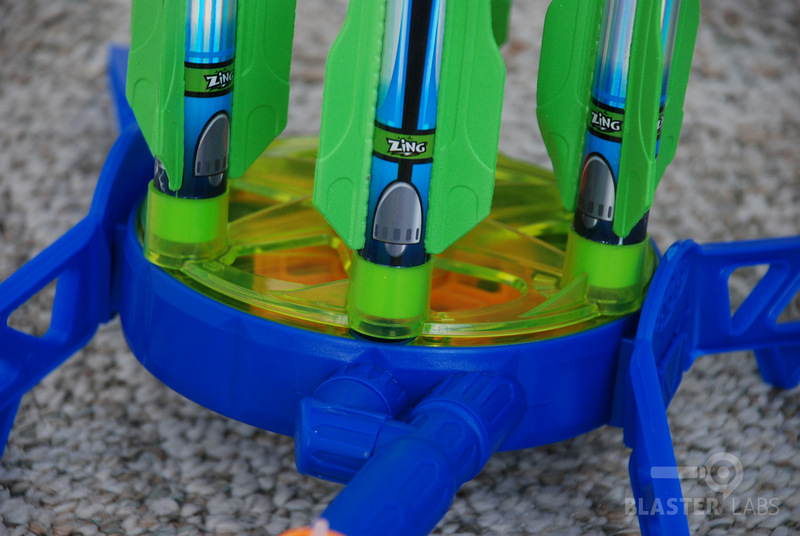 So, what does an X6 Zoom Rocketz Six-Shooter Launcher actually do? 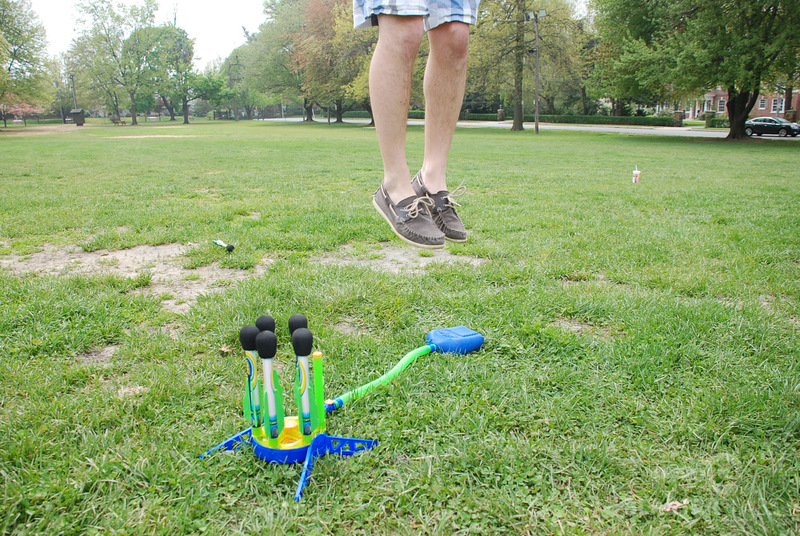 Put simply, one mashes the air bladder with his or her body weight, and the force of the air both rotates the launch platform and fires a rocket. 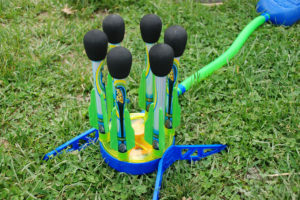 Allowing the bladder to re-inflate then allows for a second launch, and then a third, and so on, until all six rockets have been fired. The base has a modest degree of angle adjustment, to allow for distance-oriented launches (versus simply shooting straight up). 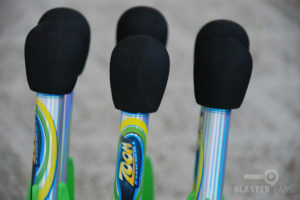 In use, the X6 Zoom Rocketz worked as advertised, though with somewhat inconsistent results. 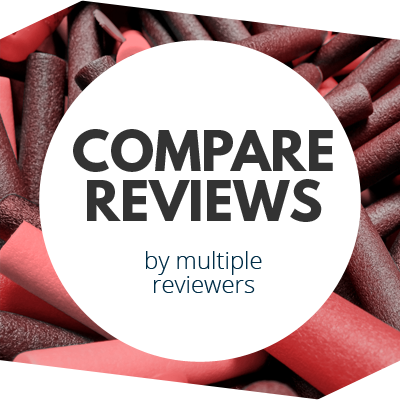 Our launching assistant was an athletic, average-sized male in his mid-20s who had no qualms about smashing the launch pad with all the force he could muster—one foot, both feet, stomping, jumping, and everything in between—and we tested out both of the X6 Zoom Rocketz sets sent to us by Zing. 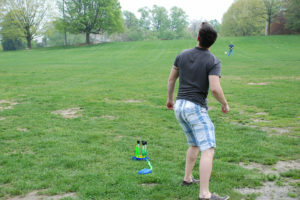 Even so, some launches barely cleared 10 feet over his head, while other shots had rockets soaring well over neighboring, 2-story buildings (we tested in both the aforementioned park, and in a parking lot outside our office). And while we didn’t have a way of easily verifying the “Blasts up to 100 Feet!” claims, we don’t doubt these heights are attainable—in fact, we’re pretty sure we surpassed this altitude on more than one occasion. 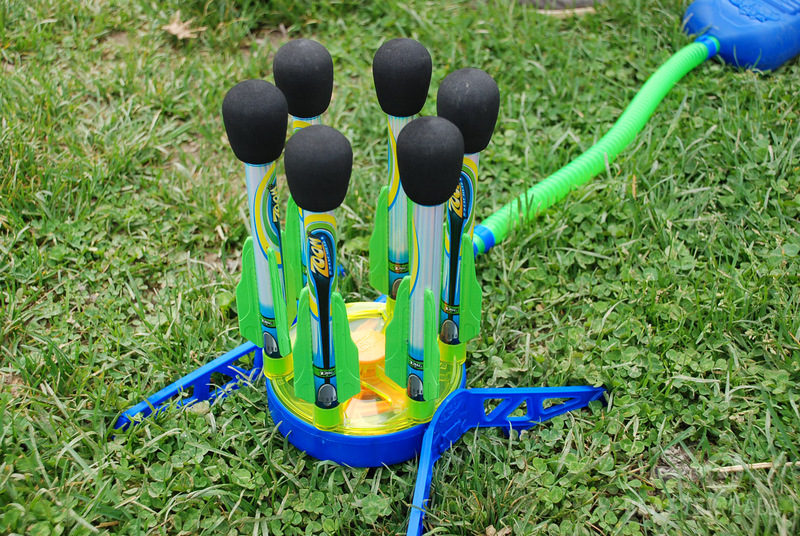 Reaching these incredible heights quickly became the primary “game” we found for the X6 Zoom Rocketz—trying over and over to launch rockets higher into the sky than the time before. The rotation of the “X6-Spin Technology” base was reliable and fault-free on both of our test units. We didn’t have any hang-ups or hesitations, with the platform rotating consistently from one shot to the next. And the same goes for the launch pad, which held-up well in our testing, and can only be faulted for taking a few seconds to re-inflate between launches, which spoiled the fun somewhat by delaying how quickly shots can be fired. But overall, we were impressed at how well everything held-up to our full-grown, man-child testing. Everything worked, nothing broke, and no special attention was required to keep things functioning as intended. 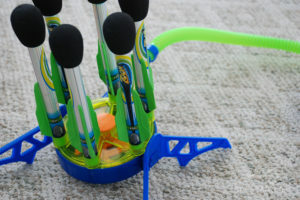 Angling the base adds to the fun, but had the kit come with some target rings that could be laid out to create an impromptu high score aiming game, we could see the long-term value being increased significantly. Unfortunately, however, the X6 Zoom Rocketz just didn’t hold our attention as well as we had hoped. 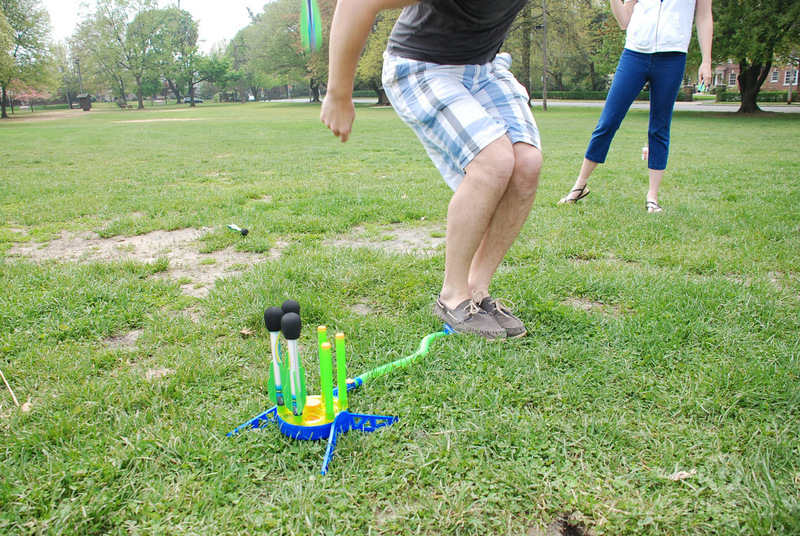 It was fun the first few times to see how high we could launch the rockets, but the novelty wore off relatively quickly—stomp the launch pad, see a rocket fly, repeat. It’s cool, but in the upright mode, rockets can’t really be “aimed,” per se, and don’t really do anything special in-flight (there may indeed be some stabilizing rotation action, but we couldn’t see it). 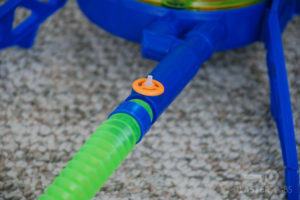 Angling the base adds to the fun, but had the kit come with some target rings that could be laid out to create an impromptu high score aiming game, we could see the long-term value being increased significantly. As it stands, the X6 provides a solid half-hour or so of fun, but isn’t something a child (or adult) is likely to find entertaining over the long-haul. Our first hands-on time with a product from our box of Zing goodies proved fault-free and delivered on the promises stated, but definitely left us longing for more. Fortunately, we also happen to have tested out the Zing Sky Gliderz during this same outing, which not only proved to be more engaging, but also performed far beyond our expectations (spoiler alert: we were able to shoot them over 200 feet!). 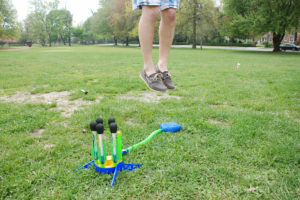 Stay tuned for more on the Sky Gliderz as we continue sharing our experiences with the selection of backyard fun-makers from Zing! Sounds like this could be fun as a “Motar”.